"Brenda J. Allen, Westbrook College, Class of 1978"
Westbrook College student Brenda J. Allen, Class of 1978, was a Fashion Merchandising major and a Day Hop. 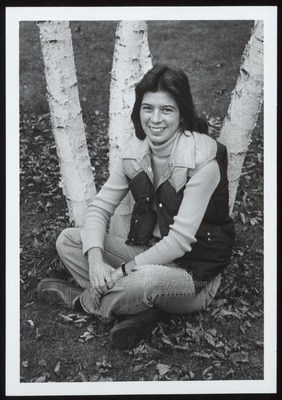 For her senior class candid photo, which appeared in the 1978 Tower Yearbook, she wore jeans, a pale turtle neck jersey, and a two-toned, quilted puffy vest. Her dark hair was parted in the middle, feathered away from her face and hung down her back. Brenda sits cross-legged on the grass at the base of four white birch trees.